Mark Rees. Ghosts of Wales; Accounts from the Victoria Archives. History Press, 2017. Wendy Hughes. The A-Z of Curious Sussex. History Press, 2017. When reading books of ghost stories, particularly those related to a specific location, it is often the case that the stories are retold and edited in a way that sometimes bears no relationship to any original account or testimony, and we are often presented with a homogenised and rather standardised narrative. In his reviews of such books, Peter Rogerson often pointed out that the modern ghost story is as much a product of the heritage industry than of any kind of psychical research, and an entry in a Good Ghost Guide is now as essential to any pub as an entry in the Good Beer Guide. In Ghosts of Wales Mark Rees attempts to circumvent this processing by bringing us the original, unedited narratives from contemporary sources, or at least contemporary sources as recorded in the newspapers of the era. Because this is a boxes-within-boxes situation, where we will never really be able to access the source. However the newspaper accounts given here are probably about as far as we will ever be able to delve at this remove. The majority of the stories here are from the latter part of the Victorian era, and this probably relates more to the coverage of local newspapers in the Principality as to the number of actual reported supernatural occurrences. Many of the stories describe experiences which are common to ghostly reports in other parts of the world, although some are specifically Welsh. A chapter on the ‘Ghosts of Industry’ recounts supernatural tales from the iron-works and coal-mines of South Wales. Stories like the haunting of the Morfa Colliery at Port Talbot after a mining disaster bear stark evidence of the trauma that such an incident wreaks amongst the local community, and gives some clues as to how the trauma resolves itself. Late Victorian Wales also seemed to have had its own breed of ghost-hunting enthusiasts well before the era of ‘Reality TV. One local councillor in Cardiff had his own programme of pavement politics, sweeping the streets clear of ghostly manifestations and calling for a “course of systematic investigation, the whole thing to be followed up, if possible, to some real conclusion” and that the investigators should be “honest, conscientious and honourable”. Well, we’ve all heard these promises from politicians before, and it seems like most such, little came of it. The ghost ‘with a mission’ is featured here. Members of a local Friendly Society, refusing to pay the funeral allowance for a member, on the grounds that he had committed suicide, found their lodge meetings disturbed by ghostly noises, and one committee member assaulted by the spirit of the deceased on his way home one dark night. As the reporter commented “such at least was the account he gave in tones of horror, at the first public house he came to after this terrific encounter”. In many of these incidents we see the phenomenon of the ‘flash-mob’, with up to several hundred local people assembling at the site of a supposed haunting, often spending the night there, shouting, throwing stones and banging pots and pans, even firing guns. The leniency to this activity displayed by the local constabulary contrasts remarkably to reactions to much less riotous escapades today! Although reading the original newspaper accounts gives a much closer look at the people and places involved, it also means that the reader has to plough through some of the most turgid prose know to man, from reporters who thought that the world hung on their every word, and were probably being paid per line. Also jarring to the modern ear are the casual, almost libellous, comments on individuals – usually those of the ‘lower orders’: “he engaged a new servant – a somewhat dull and ingenuous maid of twenty-six”. I suppose reading some of the original documentation does explain why subsequent writers have found it necessary to edit and smooth out much of the narratives of these experiences, but it is essential that we do occasionally trouble to look at the earliest possible sources if we are to understand the background to them, whether they be supernatural or psycho-social. Mark Rees does an excellent job in reminding us of this. 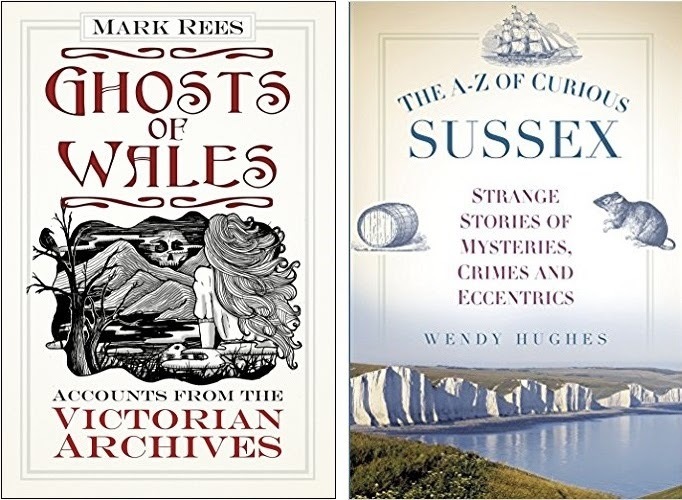 The A-Z of Curious Sussex is perhaps more at the ‘heritage industry’ end of the spectrum, with brief accounts of historical curiosities, legend and folklore attached to various localities in East and West Sussex, alphabetically from Albourne to Yapton. These range from dramatic shipwrecks, gruesome crimes, historic battles and the usual quota of haunted inns, to the disputed origins of banoffee pie, the self-made legend of Grey Owl and the moving story of the pioneer of reading systems for the blind. I was particularity interested in the legend of the pyramidal grave of ‘Mad Jack’ Fuller in Brightling churchyard, supposedly buried in his imposing tomb sitting at a dining table in full evening dress, complete with a bottle of claret; as a very similar tale is told about the pyramid covering the grave of William Mackenzie in St Andrew’s Churchyard in Rodney Street, Liverpool. Is this perhaps a recurring theme to explain eccentrically designed monuments?